Update4: Attorney General William Barr says that he is reviewing the "conduct" of the FBI during its original 2016 Trump-Russia investigation, following calls by GOP legislators to investigate the origins of the probe. After explaining that DOJ Inspector General Michael Horowitz has a pending investigation into FISA abuse, Barr said "I am reviewing the conduct of the Russia investigation, and all the aspects of the counterintelligence investigation that was conducted in the summer of 2016." Barr says he hasn't seen Nunes' referrals yet, adding "Obviously, if there is a predicate for investigation, it will be conducted." Update3: Barr says that the Justice Department's Inspector General is working on reviewing the process used by the FBI to obtain a FISA surveillance warrant on Trump campaign aide Carter Page, and that the IG report will be complete in May or June. Barr also said that he's overseeing a separate wider investigation. While the session is intended to explore the Trump administration's $29 billion Justice Department fiscal 2020 budget request, Barr will undoubtedly face questions about the Mueller report and when Congress might expect to see a redacted version. Democrats are using the redactions to suggest that Barr and the Trump administration are holding back vital information which they hope might deliver the impeachment they've sought for more than two years, despite Mueller's findings of no collusion - and AG Barr and Deputy AG Rod Rosenstein determining that Trump did not obstruct the probe. On Monday, Rep. Doug Collins - the top Republican on the Democrat-controlled House Judiciary Committee, wrote a scathing letter to the panel's chairman, Rep. Jerry Nadler (D-NY) accusing him of putting Attorney General William Barr in an "untenable but politically convenient situation." Barr would be forced to "break the law" if he provides an unredacted report - and he doesn't, Nadler will "label him as part of a cover-up." 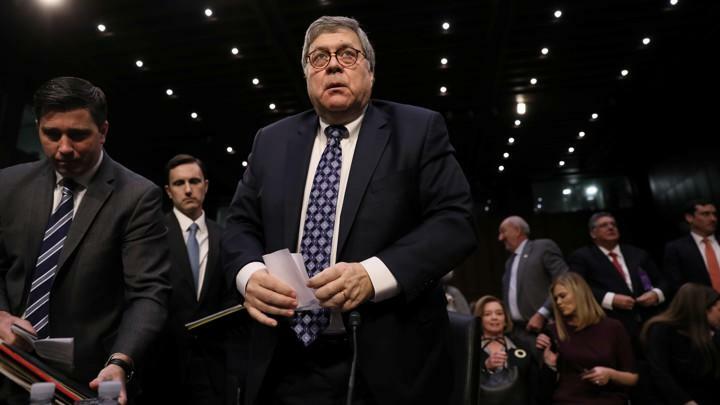 According to Barr's written testimony, the Attorney General will focus Tuesday's discussion on issues including immigration enforcement, the opioid epidemic and combating violent crime.